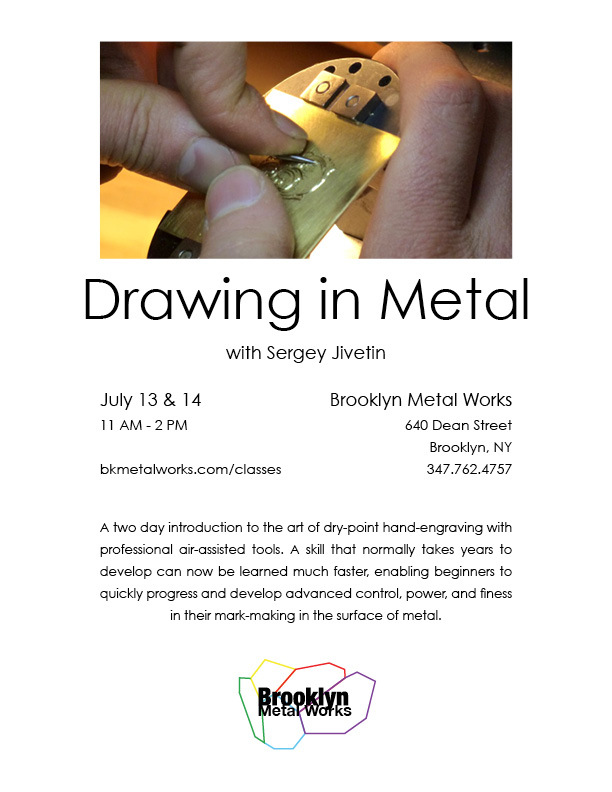 This two day workshop with Sergey Jiventin is a comprehensive and effective introduction to the art of dry-point hand-engraving with professional air-assisted tools. A skill that normally takes years to develop can now be learned much faster, enabling beginners to quickly progress and develop advanced control, power and finesse in their mark-making in the surface of metal. The workshop will begin with a quick lesson in the history of engraving, and an introduction of the various tools and sharpening methods. Focusing on a stylized decorative floral scroll motif, the participants will draw from a model, create their own version on paper, and transfer their designs onto sheets of metal. Students will learn to outline their design with various styles of line-cuts and then shade the resulting volumes to produce a stylized three-dimensional rendering. Students will then enhance their engraving tool control and broaden line-marking vocabulary by learning how to create a lettering layout and engrave simple script. This course is perfect for anyone who likes to work with the drawn line. Previous metalsmithing skills are not required. This course is limited to 6 students. Engravers are available for use during the workshop. Students are asked to bring a 6×6 inch sheet of 20 gauge brass and their own opti-visor or other magnifying glasses to class. Class meets from 11 AM – 6:30 PM on July 13 & 14.